Thinking about exploring the options for Memory Care for your loved one? The search for a new home for a senior with memory care needs usually comes in a time of crisis. That can make a confusing process into a stressful and overwhelming ordeal. With such a critical demand for our Making-a-Move services, we wanted to offer something back to the community by matching the need with the best care alternatives for each of our clients. With our reputation of honor and integrity it has given us the ability to partner within our community allowing Alee Solutions to offer this Making-a-Move service FREE. 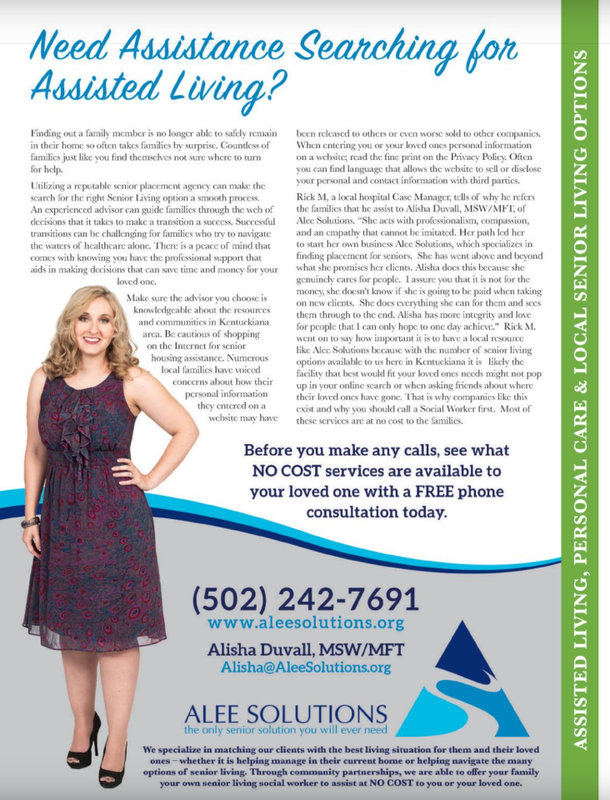 The Kentuckiana retirement industry has joined together to make what is a highly emotional and frustrating time for our clients into a time to feel energized by the loving personalities that care so dearly about the ever aging members of our community. Alee Solutions is here to reduce your anxiety by doing the legwork for you. Now, isn't that cool? So take a moment to catch your breath and hand it over to us.